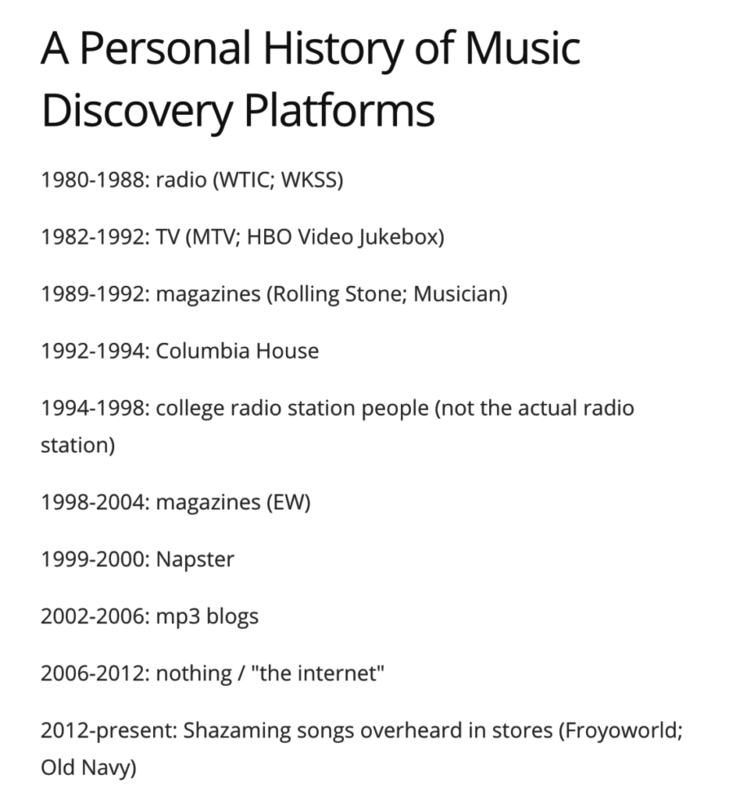 Years I wrote a Tumblr post about how my music discovery processes had changed over the years. Hold on let me see if I can find it. Ah, 4 years ago, 32 notes. Nice. This is honestly…a pretty good overview. I should have added Shazaming in H&M, where I seriously always hear something I like. Also I should have said something about the visual process of browsing the record store, and deciding whether I would like or dislike something based solely on the album cover. Probably the only significant new addition would be soundtracks of TV shows & movies, a lot of my favorite songs these days end up being from Killing Eve or John Wick or whatever. The subtext for writing about this then and now is how Spotify’s algorithmic recommendations increasingly reinforce the stuff I already like, and do increasingly little to prod me in new and random directions. There’s a brief uptick in the UX where you’re like Hell yeah I do love this and then a long falling tail where you realize you might just be listening to the same songs forever until you die, and this, this, is the elderly out-of-touch-ness you were worried about all those teenage years ago. Anyways what was my point. Yes: so the other day I was at the Porter Square T stop. If you’re not from the Greater Boston Area, Porter Square is the deepest station on the entire MBTA system, and therefore has the longest escalators. They’re actually a little unsettling if you think about it too much. But anyways I was riding them up to the surface the other day and every so often on the handrail someone had strewn flyers for an upcoming live event of some kind. I wasn’t paying attention the first few times I saw it, but like I say it’s a long escalator ride, so eventually I picked one up and read it. Some kind of world music fest, pass. It listed a bunch of bands I’d never heard of, but one band name stuck out for whatever reason – M.A.K.U. SoundSystem. I thought: I should check them out later to see what they sound like. And I did! They’re on Spotify, they have live videos on YouTube. I was pretty into it. I found one particular song I liked and added it to my playlist of music I have liked in 2019. It won’t be enough to encourage the Spotify needle to lead me down a new and exciting musical journey, but at least I I still got it, it being the capacity to listen to something I haven’t already heard.